1/16" x 12" x 12" Cork Square | U.S. Plastic Corp.
Cork offers elasticity and is nearly impermeable making it resistant to liquids. It is an excellent option for gasket material. Cork is naturally fire retardant and offers thermal insulation. 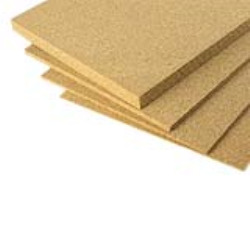 Cork squares with PSA (pressure-sensitive adhesive) backing also available - contact us for a quote. Dimensions: 1/16" x 12" x 12"